The Riding House Café may call itself a café, but let’s get one thing straight – the modern all-day brasserie is a restaurant in every sense of word. It’s been cleverly split into two with a bar area that houses a long wooden table for casual drop-in diners. The bar then leads into a main dining room with leather chairs and banquettes, sumptuous wood panelling and gorgeous low light pendants which have been brought together with a slightly retro feel. The Riding House Café is gorgeous, and it has to be one of the sexiest restaurants I have seen of late. And then it has the kind of menu which makes you want to taste everything. There are lots of smallish plates for sharing, satisfying sounding salads and hearty rustic mains. Make no mistake; the clever people behind The Riding House Café took great pains in the design of this outfit. This is the kind of restaurant you want to come to eat at and slink around in. With such great expectations, we decided on a number of small plates, starting with the chicken liver parfait (£5) with truffle butter, cornichons and served on crostini. The parfait was creamy and tasty, and this would have been a good dish had it not been for the over seasoning. 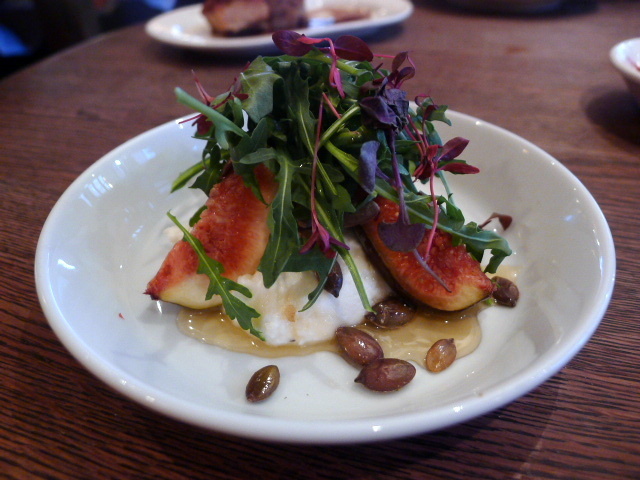 Goat’s curd, figs and honey (£4) was yummy and satisfying. The combination of the savoury overtones of the curd with the sweetness of the honey was quite delightful, and the addition of toasted pumpkin seeds was a nice crunchy touch. 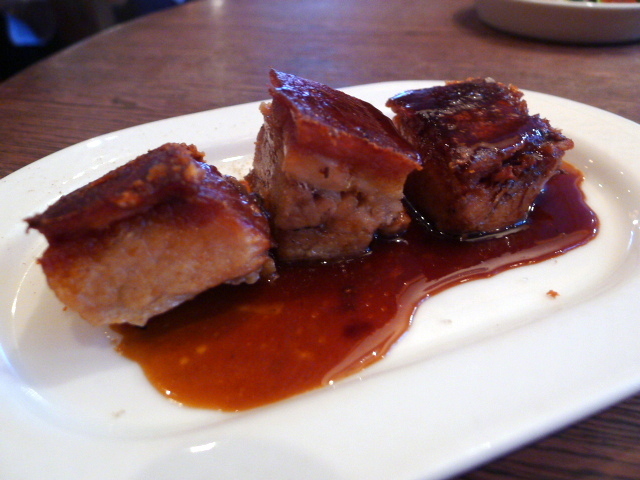 Slow roasted pork belly with cumin salt (£6) was flavoursome but dry. However, the crackling was good and popped nicely in your mouth. 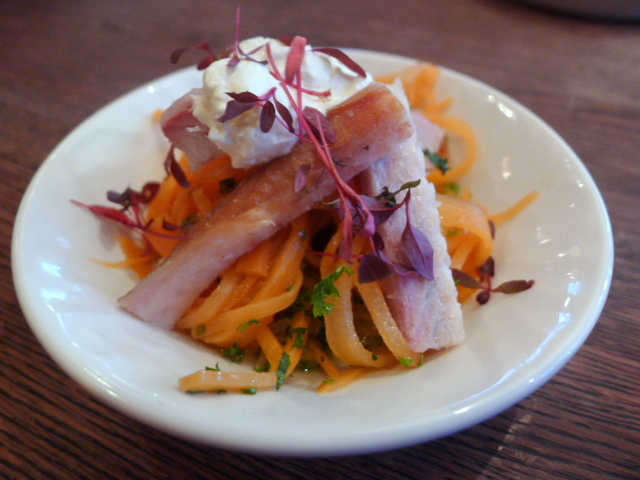 Smoked eel (£6) was meaty and tasty, but the accompanying pickled carrots were overpoweringly sour and jarred the palate. Less vinegar, and this dish would have worked as it was a conceptually good dish. 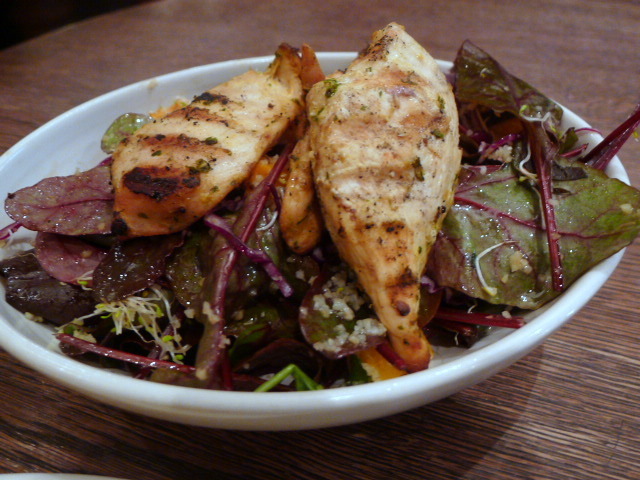 A starter size of herb salad (£6, £10 for a main) with chicken (£4 supplement) was ok. The leaves were fresh and crispy, but the dressing was a little bland and the chicken was bordering on dry. 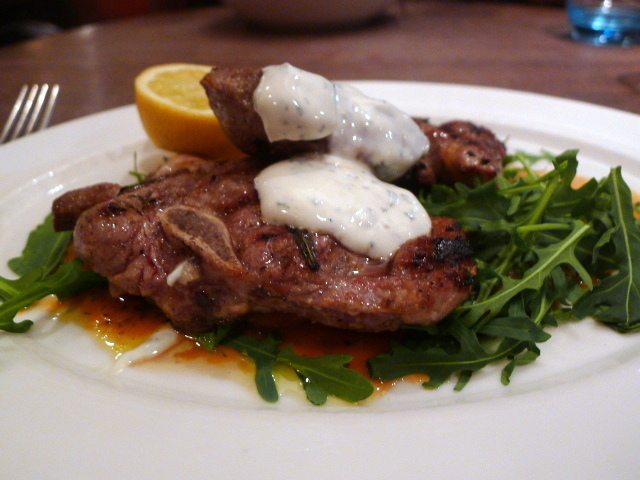 A main of grilled lamb chump chops (£17) was tasty with a gamey meaty flavour, but again it was over seasoned. Otherwise this could have been a wonderful dish with its accompaniments of butter beans, mint and yoghurt. 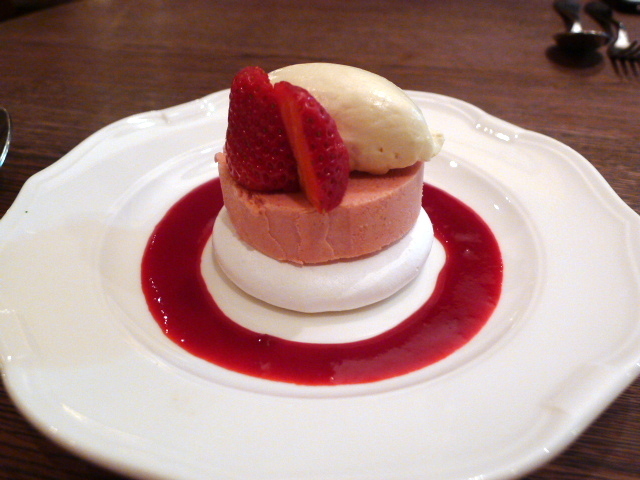 Ice strawberry parfait, meringue and Chantilly cream (£6.50) was pretty as a picture. The meringue was excellent and the cream was luscious. The parfait was good too, but a touchy icy. We were assigned a waitress who was polished, attentive and professional. But there were also one silly waiter who, when we told him that the fresh plates that had had been brought to us hadn’t been cleaned properly, took the dirty ones away but failed to reappear with new ones. 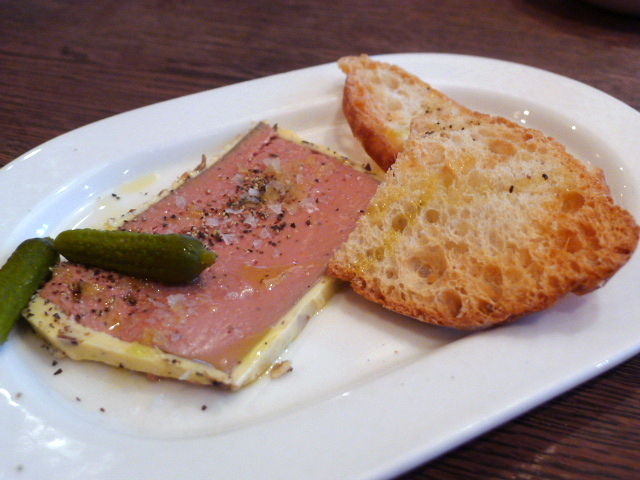 I liked the food at The Riding House Café – it was decent. But with a menu that was an attractive read, and a decor that was a diner’s dream, I had really wanted to love it. The execution of the cooking showed promise, and there were many hints of good technique, but almost every dish had a little niggle in it, and for the silliest of reasons such as over seasoning. But all said and done, this place will no doubt draw in the crowds. It has great appeal. But I’m only going to give Riding House Café a 3/5 for food. Harsh I know – it could have, should have been more – but chef, you really need to taste your food. Price range: About £24 – £40 for three courses. Excludes drinks and service. The Riding House Cafe is my local restaurant. I love the food and the decor. It really is a great place to have on your door step. The reason it is only getting an “average” from me is the service. It lets itself down every single time I go – when something doesn’t turn up on time, or the waiter forgets an order, or they bring you something twice, and the list goes on. For brunch a couple of times the coffee has taken 40 minutes to arrive, which really is unacceptable. The worst thing about it is that when I complained to the manager, he was unapologetic and I had to ask for the bill to be reduced. Please get your act together, RHC! I want to keep on returning, since London lacks credible alternatives for brunch venues, but you must improve your service. Yes I can see that how the restaurant might rest on its laurels with service. We had a good waitress, but there was evidence of silliness from another waiter.